First Sentence: Samuel Spade's jaw was long and bony, his chin a jutting v under the more flexible v of his mouth. So, full disclosure, I've read a lot of Nancy Drew books (like three dozen of them) and that's about where my knowledge of detective novels begins and ends. I've read Poe's ratiocination stories and maybe a couple of Sherlock Holmes stories and that's almost it for the classics with a few notable exceptions that I'm forgetting right now*. What I'm trying to establish here is that this is a genre I'm extremely unfamiliar with, haven't really sought out, and, dare I say, don't really care for. 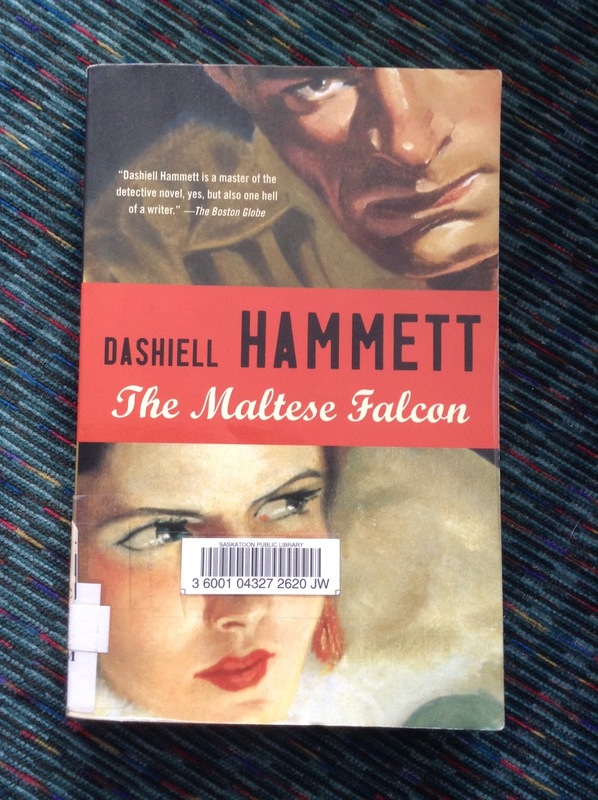 Dashiell Hammett's The Maltese Falcon is the prime example of the hardboiled detective novel, and this was kind of a problem for me. Like all parodies of the genre, the novel begins with Sam Spade's secretary ushering a beautiful woman into his office at his private detective agency. The woman, Miss Wonderly, tearfully tells Spade that her sister has run away with a shady character, and she needs his help to find out where this man, Floyd Thursby, has taken her sister. At this point, Spade's partner Miles Archer comes into the office and the three of them agree that Archer will follow Thursby that night. In almost the very next scene, Spade gets woken up by a call telling him that Miles Archer has been found shot dead. Not much later, Floyd Thursby is dead, too, and Spade confronts Miss Wonderly about it and how she's definitely not all that she appears. 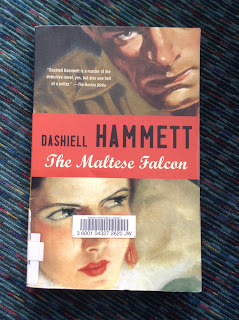 Eventually there actually is a "Maltese falcon" involved. Spade is hard-boiled for sure. He drinks and chain-smokes in a lovingly detailed way (he rolls his own cigarettes just about all the time) and goes from bed with the femme fatale to punching dudes out with almost no change in facial expression, cool as a cucumber in virtually every situation. Hammett describes him as a "blond satan" in the first paragraph. He's a character that I didn't particularly like, what with his womanizing and his utterly ambiguous personal code of ethics, but I think Spade's character flaws are a feature, not a bug. None of the other characters are quite as alive as Spade is, although I loved his secretary, Effie Perine, and I'm not saying that they were hollow shells or anything, either. In fact Spade's inner life is possibly the biggest mystery of all in this novel. It's never clear exactly what he's thinking or how much he knows, even after he gets the main villain of the piece to explain everything. Hammett himself was a private detective with the Pinkertons, and I'm really curious how that compared with what he's depicting here. His style, with the cigarettes and the blond satan and all that, is intriguing and could probably be called hard-boiled, too. He doesn't waste time on flowers in his prose, but instead concentrates on exactly where his characters are putting each of their hands. I have to admit, this was a hard one to rate. I'd hoped to love it more than I did. At most points I didn't love it at all, just sort of quietly enjoyed it. It's a 3/3 the way Kim is a 3/3: not useless or uninteresting enough to be a 2/3 but it didn't blow me away. Give it a shot if this is a genre you like or you're curious about (but be aware that there's some 1929-vintage misogyny and homophobia in it).